A few behind the scenes glitches this morning means that this first blog post of the week comes to you a little later than planned, so good job it’s such a corker! 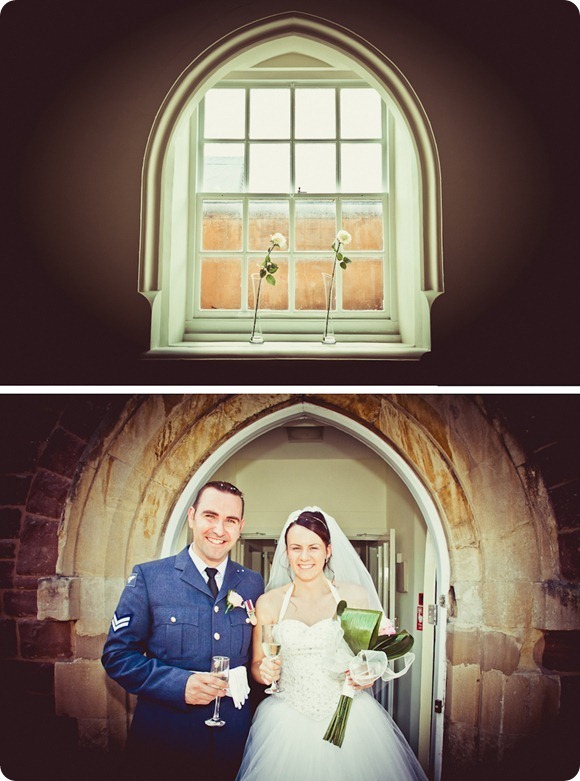 Northern couple Beki and Pete were married in sunny Hereford last summer and after feeling the sun on my back this weekend, their photographs by Kama Catch Me Photography have me super excited for a balmy English Summer. Fingers crossed! 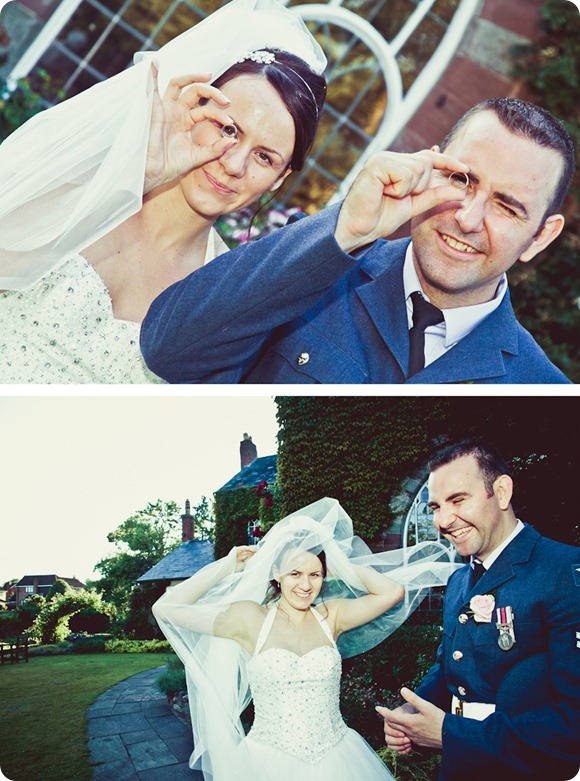 Beki says: We got engaged on 14th June 2010. It was our second year anniversary and after a meal at the same restaurant we had our first date in, we walked to a place overlooking the river and he asked me there. He took ages to ask and I nearly suggested going home (not realising what we were there for). I’m very glad I stayed to hear it but I couldn’t quite believe it was happening! Even when he pulled the ring box from his pocket, I had to wait to hear him ask me to marry me in case it was just a pair of earrings! I was pretty adamant I didn’t want the reception at a hotel after reading the requirements and restrictions on each website. I didn’t like the idea of being told what to do and wanted to create our own day rather than a pre-designed package. 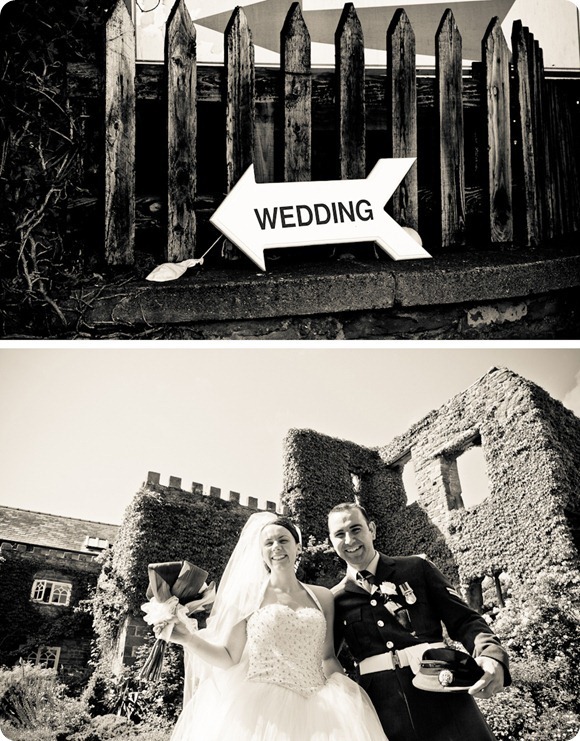 Sue at Wilton Castle was incredibly helpful and really wanted to make sure that everything we needed or wanted was carried out. The castle itself has beautiful scenery and is very unique. 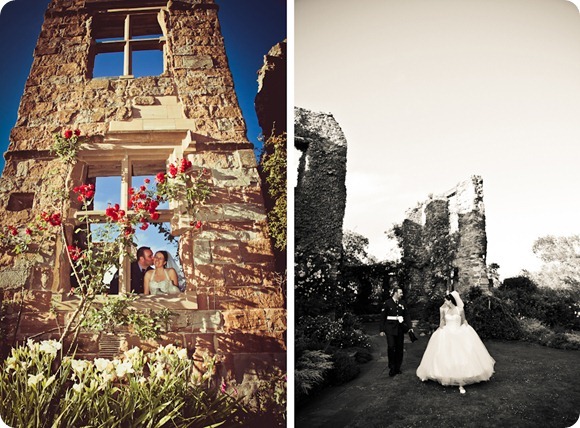 It’s full of flowers in the summer and is surrounded by the ruins of a castle, while overlooking the River Wye. It was perfect! I arrived in a white limo listening to Madonna’s 80’s classics! It was like our own little disco in the back with flashing lights! 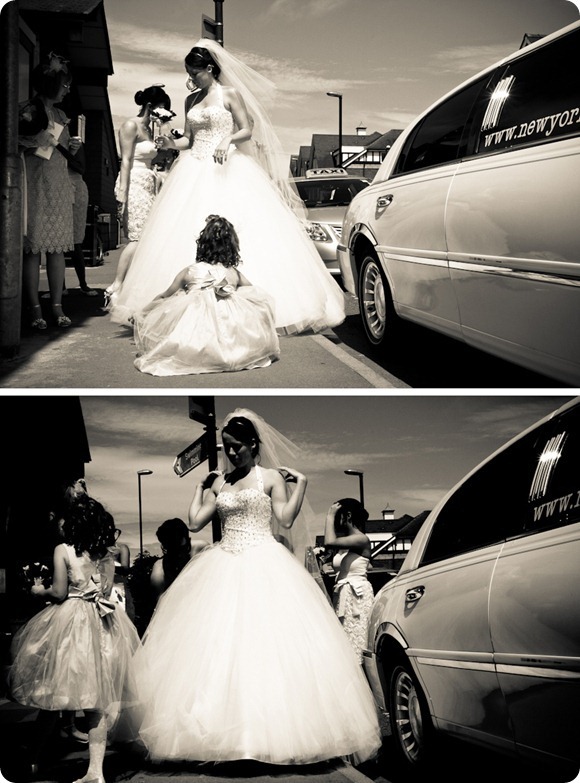 I had to fit my six bridesmaids, my mum and me with my huge dress in the car so it needed to be big! 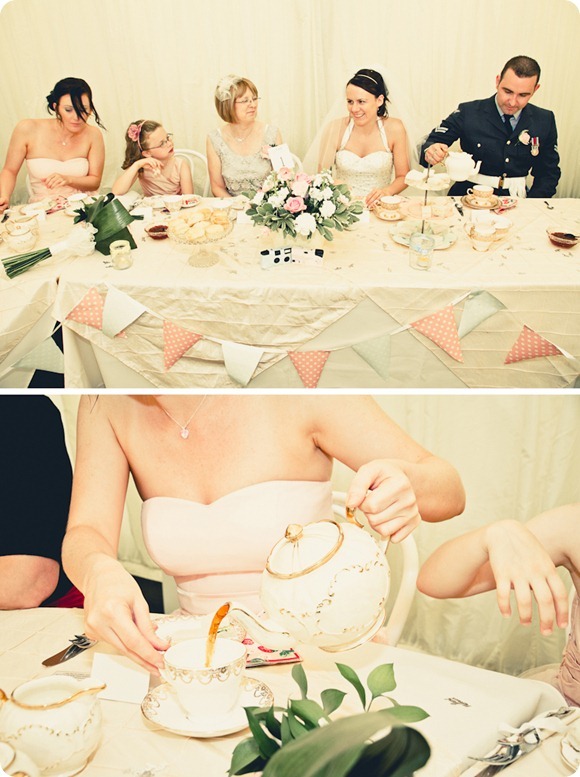 I love the vintage look and went with an English country tea-party theme. We had a marquee in the castle grounds with bunting, a cream tea (followed by a hog roast in the evening) and vintage crockery. I created a sweet table instead of offering favours and it was very well received! 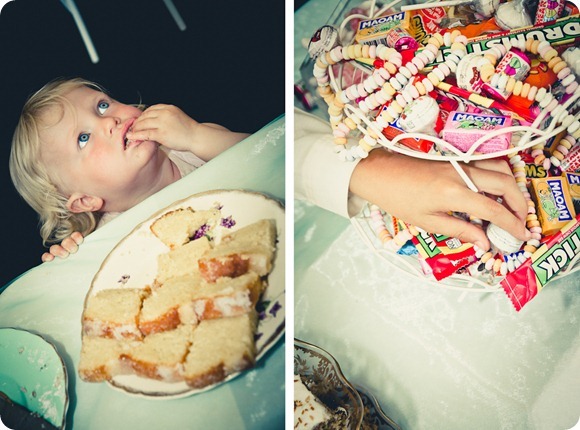 My youngest bridesmaids really enjoyed the job of refilling the sweets as they ran low! 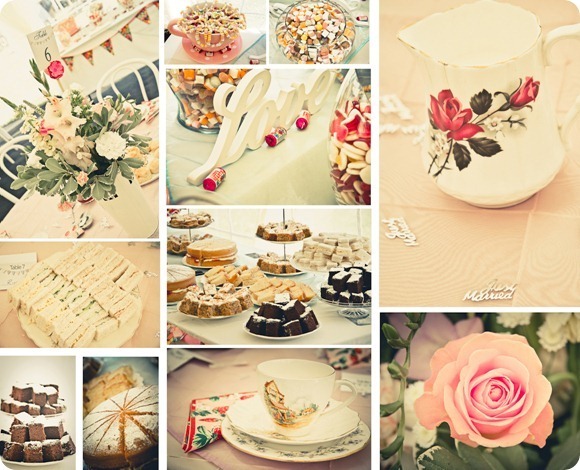 We kept things pretty with lots of pastel shades – the table cloths were a mixture of pink, blue and lilac and the crockery really stood out as it was a variety of different pieces. 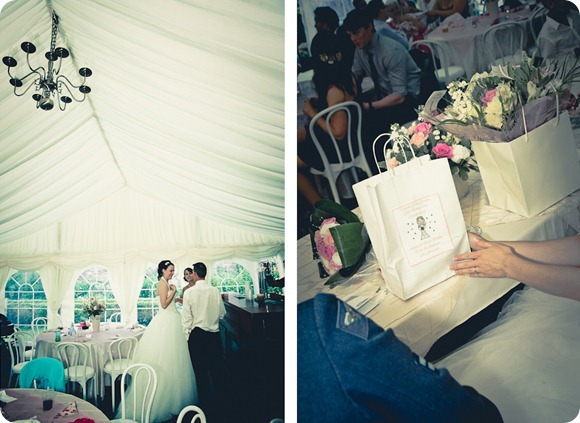 We kept the inside of the marquee in a plain white colour with long drapes around the windows to contrast with the colours on all of the tables – it really had the WOW factor as you walked in. 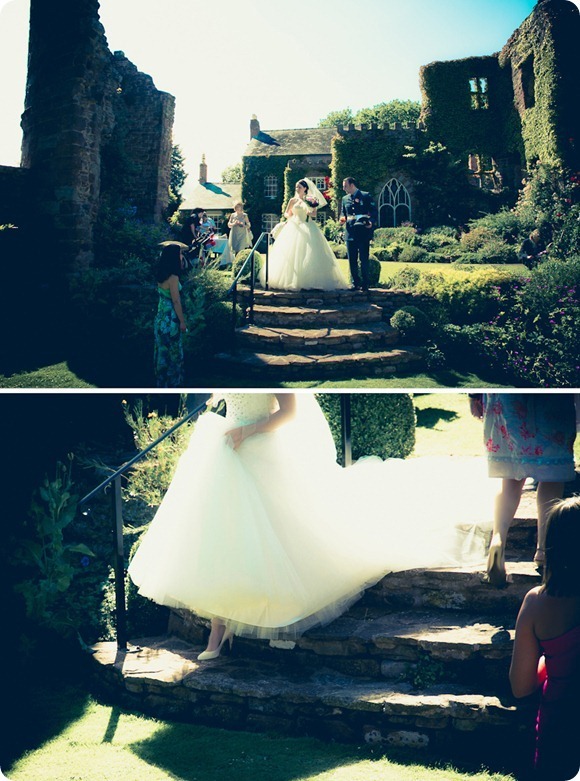 I chose a princess dress with a halter-neck style bodice covered in diamanté’s and a very full, floaty skirt. 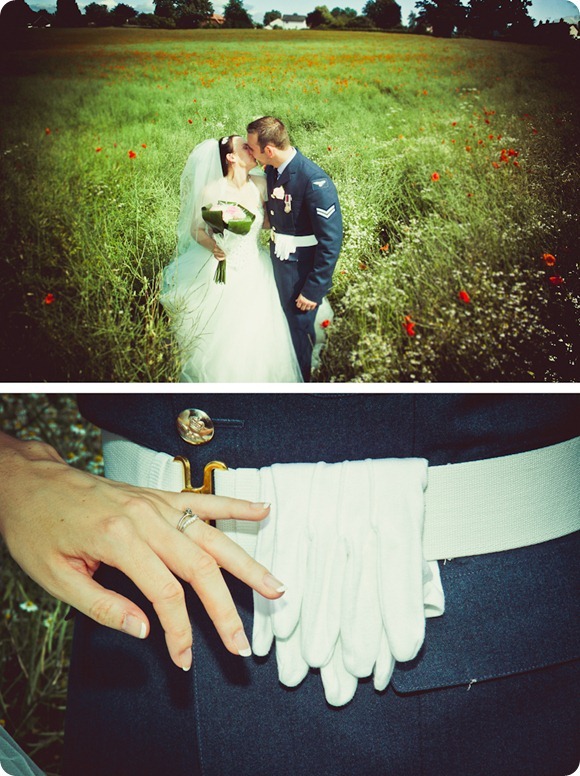 I choose a long veil which fell to the floor and was made out of the same material as the skirt. In the end, it didn’t need any alterations as it fitted me perfectly! 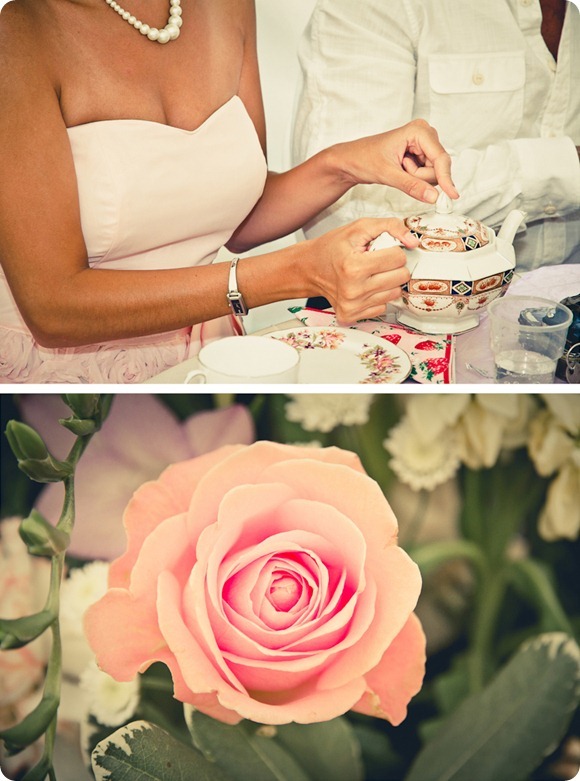 I carried a mixture of pink and cream roses surrounded by folded waxy green leaves. I also had small diamantés inside some of the roses to match my bodice. I had three younger children all in light pink tea dresses (from Next). 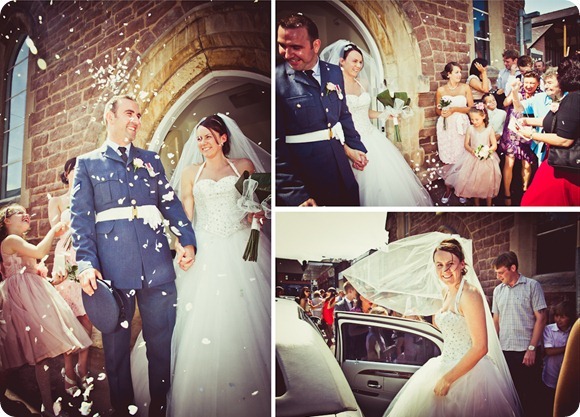 They were all sleeveless with a rose on the waist over to one side and a layer of netting over the skirt to give it a fairy-tale look (just like my dress). 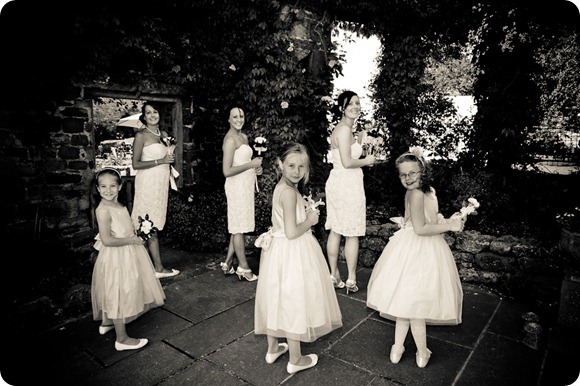 The three older bridesmaids wore pink fitted strapless dresses (from very.co.uk) with a loose bow on the waist and roses all down the length of the skirt. 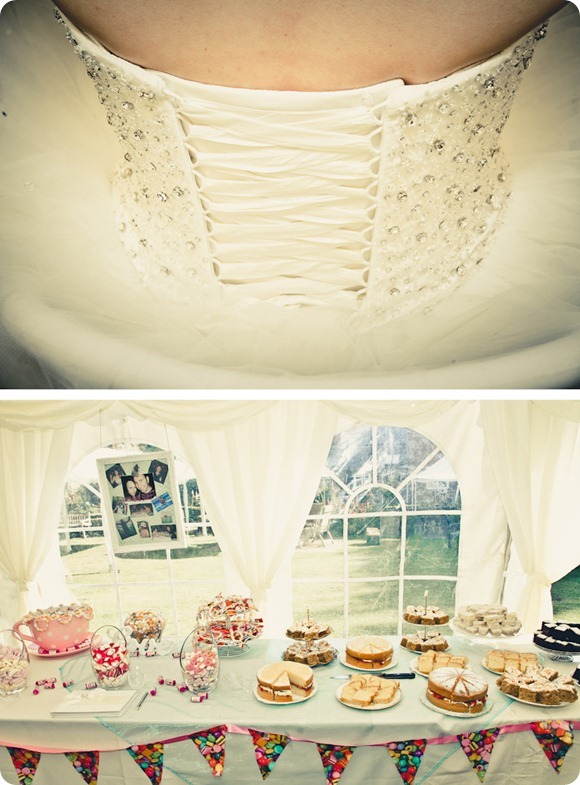 We had a cupcake tower with pink and cream swirly icing and little rose buds and daisies on the top. We had a small-ish cake on the top to be able to cut which was made from chocolate – we took it away with us on honeymoon. Pete found a funny cake topper with a bride dragging the husband back which I liked a lot better than the traditional styles. I think the whole day was a little bit different compared to the traditional way. We didn’t get married until 3pm so it meant people didn’t really have a chance to get bored as the day flew by after that. We arranged to serve a cream tea rather than a sit-down meal as it was a boiling hot day, I love cream tea and it was in-keeping with the theme of the day. We opted out of lengthy speeches and my husband and the best man just said a few quick words – I was then forced to stand and say something (with no preparation)! As we invited so many children, we wanted to make sure that they were kept occupied. I made a soft play area in the marquee corner for the youngest children and garden games outside for the oldest. Along with this, they had tonnes of space to run around (which they did a lot of!) and they had the sweet favour table where they refuelled! 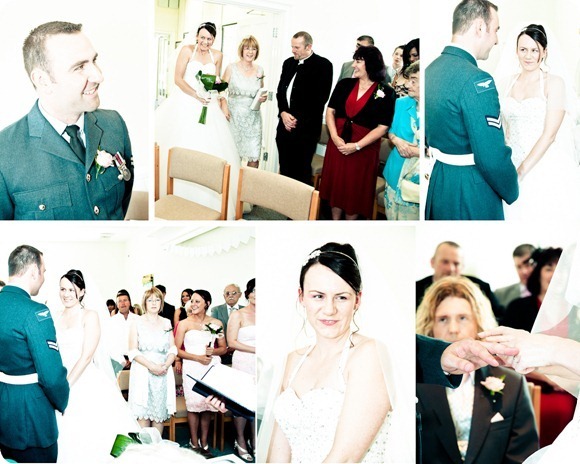 Walking into the registry office and seeing Pete for the first time was my favourite part of the day. I spent the whole ceremony grinning from ear to ear and the registrar commented that she hadn’t seen such a smiley bride! 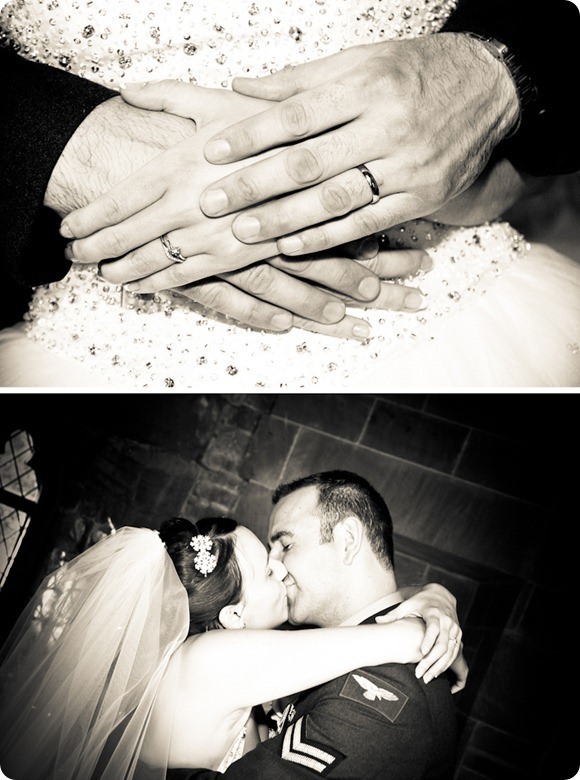 I loved hearing Pete read his vows and watching him stumble trying to get the ring on my finger – it was all like a dream. Pete is in the RAF and we were unable to go away for very long straight after the wedding due to his work commitments so we went to Centre Parcs for the week. 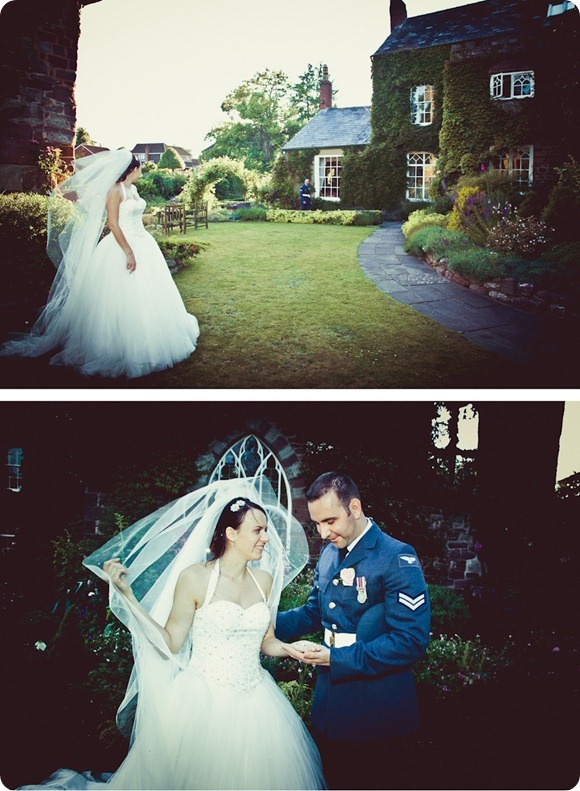 It was lovely to relax and unwind after the worry of planning the big day! This March we will be going to the Maldives for our official honeymoon and we are both very excited! Our guests contributed so we will hopefully have enough money to do some fun excursions while we are there. 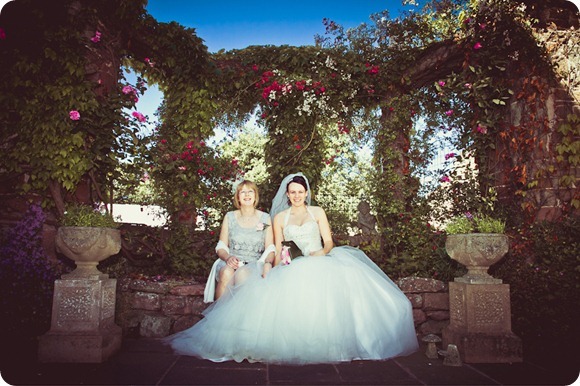 My top tip for other Brides Up North would be to relax. On the day you really don’t care about the little things as collectively, everything is just amazing! You will have planned to within an inch of your life so enjoy it! 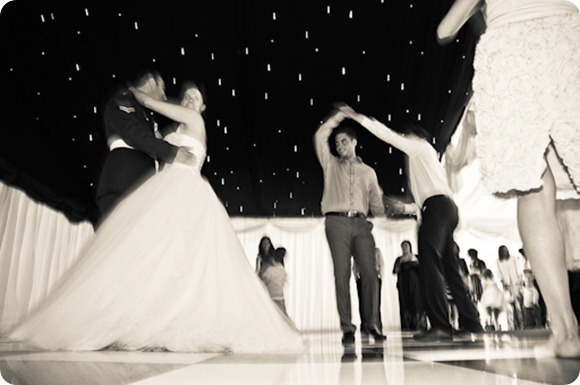 On the day itself as we left the registry office, I was told that the DJ hadn’t turned up. I had a moment of panic but then calm washed over me and I just thought, we’ll put a CD on! In the run-up, the very idea of that would have sent me into melt-down! Newly wed? 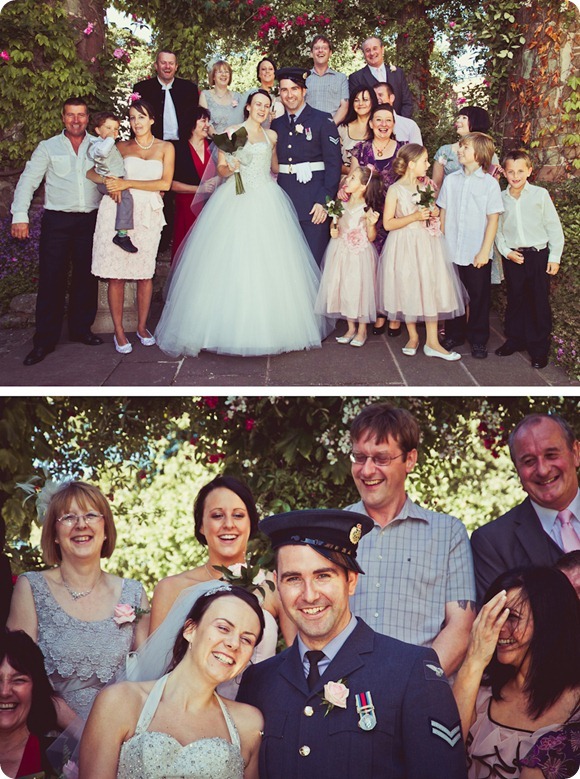 Contact me to share your Real Wedding memories on the wedding blog.